Sometimes you get a hankering for food you just can’t purchase in your area, that’s when you have to make due with what you can whip up in the kitchen. 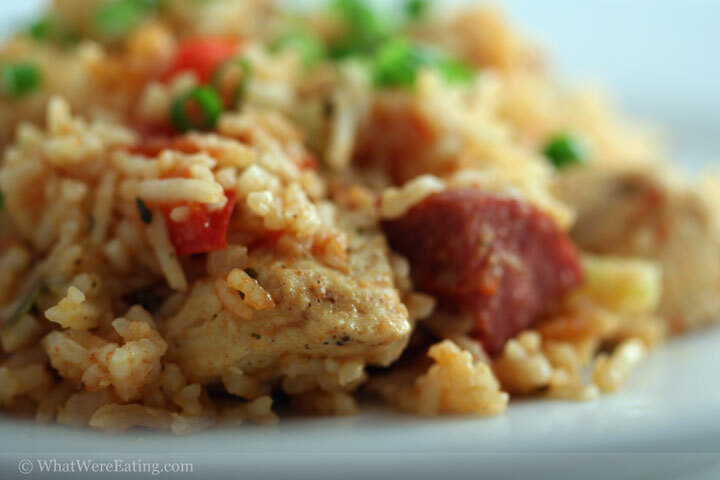 We’re eating a take on the louisiana classic – jambalaya. My rice dish featured summer sausage instead of smoked or andouille sausage, chicken breast meat, and fire roasted tomatoes. It was also seasoned with something a little out of the normal – rosemary. Here’s to rice!T: This jambalaya was actually pretty darn good, but when I first saw it I was worried it would taste little like the real thing. It tasted exactly like jambalaya should, though. What was really surprising was how well the summer sausage went with it. I would have been the first one to scoff at using summer sausage instead of “real” sausage, so it was a pleasant surprise. A: summer sausage is inherently tasty… and when you are shopping at the local corner store for ingredients, you’ll take what you can get. it was either summer sausage, pepperoni, soppersata, or salami. i had to go with the summer sausage. even going into making the meal, i didn’t know how close to the real thing it was going to taste…and actually, i didn’t really care. my focus was on producing something that was tasty! especially since i was making so much of it! T: I like your focus! Well, I give this one a 4.3/5. It was very tasty, and I enjoyed being surprised by the summer sausage. You probably have some room to improve the dish (since you’ve barely made any jambalaya at all), but I give it props. It was certainly way better than many other jambalaya’s that I’ve had. A: even though i’m sure i’ve not had nearly as many versions of jambalaya as you (since i only lived in louisiana for 7 years) i thought it was pretty darn good. i guess it’s easy to appease yourself when you’re the one seasoning the dish! i give the meal a 4.44/5. i know it’s wrong, but i could eat this frequently. i love rice… and rice-y things. T: dude, look who you’re talking to… I love rice. You can’t go wrong with rice. Mmmm… pour some gravy over it or whatever. A: hehehe it’s a good thing you said that, because i was about to make a lewd comment. fortunately for you, you caught me. so, i’m taking baby steps towards making paella. if only i had the right pan and a decent burner that was more than 5 inches in diameter. A: one day we’ll be able to have both health insurance and a decent set of tools! Add the canola oil to a two quart saucepan and place over medium-high heat. Season all sides of the chicken liberally with kosher salt and freshly cracked black pepper. Once the pan is hot (just before the oil starts to smoke), add the chicken to the pan. Brown the chicken, a couple of minutes per side, then remove from the oil and set aside. Turn the heat to medium to medium-low then add the diced onion, bell pepper, and celery. Sweat the veggies, stirring occasionally, until the onions are translucent, about 10 to 15 minutes. Add the bay leaf, stewed tomatoes, water, browned chicken, cubed summer sausage, a teaspoon of kosher salt, and a liberal pinch of freshly cracked black pepper to the pan. Turn the heat to high and bring the ingredients in the pan to a boil. Once the jambalaya has come to a boil, cover then reduce heat to low. Simmer the rice covered over low heat until all the liquid has been absorbed, about 20-30 minutes. Remove from heat and let rest, covered, for another 10 minutes. After resting period, fluff with a fork and serve immediately with a bottle of hot sauce on the table! Enjoy! heheheh that’s great! you should reminisce some more since you are going to have to be a for real adult tomorrow!!! i can totally imagine the scene going down on state street. we had plenty of them there too, but alas, never was there a rotten summer sausage scene! i know exactly what you mean. i get the same way for carribean food. that looks so delicious, is it baked or cooked on the stove? yum, DRool. It was not rotten. It was from Hickory Farms, and was made to never go bad. It was just floating in the oil, which probably made it healthier. We may have launched it down the way in a water balloon sling shot, like many other things, along with putting dog poo, or was it mine in some jerky guys golf shoes they always left outside. I know, I know, it has nothing to do with summer sausage really, or anything but it brings back good memories…….or the few I can remember. Ha ha I get it now!!!! Jambalaya made with summer sausage, in the winter, har har har!!!!!! Next you will make vichyssoise with winter savory, you ol’ jokster you!!! Way to be creative! I love summer sausage so much, I once asked for a giant log for Christmas. I got seven. Never gonna do that again. I am just cracking up @ ‘Bobby’, love his random, fly-by-the-seat-of-his pants comments. Wacky guy! Anyhoo, now I am going to copy this recipe & make the wonderful sounding stuff. Toodaloo. I got a giant hickory farms platter/heart attack from one of my customers at work. I’m a little tired of cheese and meat. In my desperate attempt to find something else to do with it besides add mustard and crackers, i came across your blog. This is awesome… and thanks. I added a shot of Dewars right before the simmer to give it a little something extra. turned out great. I tried this recipe tonight!!! It was awesome!!! And so easy to prepare!! Thank you! !